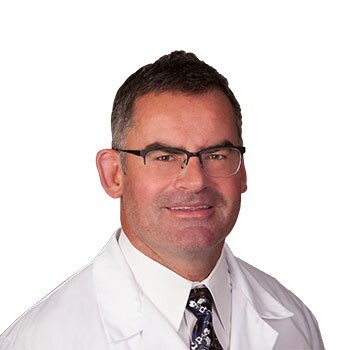 Dr. Lammen’s grew up in Brockville, Ontario – along the St Lawrence Seaway and moved to the States in 1998 to join Panorama Orthopedic and Spine Center. He specializes in hip and knee replacement, including partial and total replacement and is a sought after expert in revision surgery. “When I was in 10th grade, my sister was in elementary school and spent 3 – 4 months in the hospital with a bad hip. I visited every day and it was that experience that left me interested in becoming an orthopedic surgeon,” said Dr. Lammens. He finished school and training in Canada then worked in Windsor, Ontario as a general orthopedic surgeon – treating backs, knees, and hips. Dr Friermood, who at the time was the President of Panorama Orthopedics, was friends with Dr. Russ Layton, a world-renowned trauma surgeon from Halifax. Dr Lammens had completed his orthopedic trauma training with Dr Layton and he was subsequently recruited by Dr Friermood to come to the United States and work at Panorama Orthopedics as a trauma, spine and joint surgeon. He was the 7th doctor to join Panorama. Orthopedic trauma surgeons are well versed in the very toughest and most difficult cases. Joint Replacement as a specialty is very similar and operates with a similar skill. Dr Lammens is on-call for trauma at St Anthony’s Hospital where he treats the most complex and urgent orthopedic cases, including those patients who come in on Flight for Life from around the region. Dr Lammens added joint replacement surgery to his repertoire in 2007. He now also completes at least 450 joint replacements a year at Panorama Orthopedics. In addition to traditional joint replacement, Dr Lammens is also skilled in revision joint replacement. He is experienced in knee replacements, hip replacements, partial knee replacements and revision surgery. In addition to these more traditional procedures, Dr Lammens is a specialist in Birmingham Hip Resurfacing. This is a technically demanding procedure and only a few surgeons in the region are trained in it. People travel from all over the country for Dr. Lammens specialty in the Birmingham hip. Often times they are accomplished athletes who are looking to cure their pain from arthritis without a full hip replacement. In 2007 the Birmingham hip became FDA approved. Surgeons in Canada had been doing the procedure for a while, so Dr Lammens traveled to Calgary to be trained in the technique. The Birmingham hip resurfacing is primarily for younger men in their 40’s and 50’s who have hip arthritis. The procedure cannot be done on females, because as females require an implant smaller than what is made and as they age they lose bone density, which makes the anchor for the Birmingham less effective. People started seeking out specialists in this area and often they find Dr Lammens. He is currently doing at least one of these procedures each week. “It requires a significant level of experience and expertise to complete this procedure. It is hard as you need to work around the complex areas of the hip and the alignment is a very critical part of a successful procedure,” says Dr. Lammens. “Also, selecting the right patients for this technique is critical,” he adds. When Dr Lammens in not at work, he loves to be active and enjoy the outdoors! In college, he was a football player at the University of Toronto. With his roots in Canada, Dr Lammens is a long-time hockey player. He started as a kid and today plays in an adult hockey league in Colorado. An avid and accomplished skier, Dr Lammens would be found skiing the moguls and the back bowls. He grew up sailing and till enjoys that today, when he finds his way back to the water. He is also learning kite sailing. In addition, to all his athletic endeavors, Dr. Lammens also plays the piano. Dr. Lammens sees patients at Panorama’s offices in Golden and Highlands Ranch.